Johnson Evinrude OMC Rod Bolts. 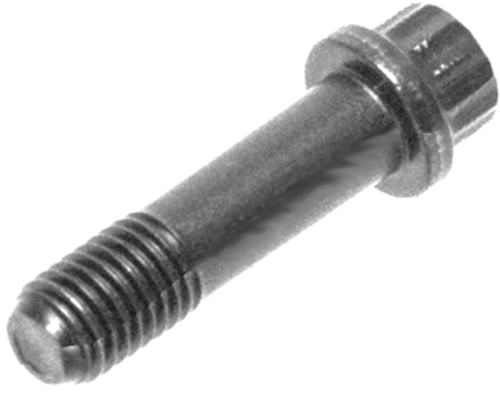 These Rod Bolts are direct replacements for the following Engines: 1981-93 30HP 2Cyl, 1977-93 35HP 2Cyl, 1985 60HP 3Cyl, 1984-86 65HP 3Cyl, 1976-85 70HP 3Cyl, 1976-88 75HP 3Cyl. V-4 Crossflow Engines: 1993 65HP Jet, 1993 80HP Jet, 1979-80 1992 85HP, 1993 85HP (TTL), 1987-93 88HP, 1981-93 90HP, 1971-81 1992-93 100HP, 1984-87 1989-93 100CHP, 1986-89 110HP, 1974-84 1991-93 115HP, 1984 115CHP, 1974-76 135HP, 1977-84 140HP, 1988 1600CC. V-6 Crossflow Engines: 1978-88 1989-91 150HP, 1985-87 1989-92 155CHP, 1977-83 1986-91 175HP, 1984-85 185HP, 1976-83 200HP, 1978-79 1980-85 235HP.Two Rod Bolts required for each Cylinder. All Rod Bolts are packaged 1-ea. 12 required per engine.